WE get so much wet weather in Scotland that we’ve coined countless phrases to describe our drookit days. It feels like it’s always spitting, stoating or peltin’ doon. Now novelist Ron Butlin has written a book on the subject. He tells Tracey Bryce the Honest Truth about rain. Why did you decide to write about rain? Hearing that Eskimos have more than 40 words for snow, I was certain that we Scots could come up with an even better word count for rain. As it turns out, we can. Much, much better. I had such fun writing this book! Just how much rain do we get in Scotland every year? It varies. Whereas the west enjoys a good drenching of about 3,000mm per year, the east coast, though usually a tad colder, gets by on a mere 800mm. Is it the wettest place in the world? Not by miles. However, as we know from the frequency of those unco dreich days, our country is certainly one of the cloudiest. Mawsynram in India holds the world record for highest average annual rainfall: 11,871mm. How many different words did you come across? The publisher asked for 50. After I reached 70, I stopped counting or I knew the book would never get finished! How and where did you find them? I was brought up in Hightae (1,112mm of rain in a typical year), near Dumfries. We kids all spoke Scots and the weather kept our rain vocabulary pretty vibrant. On one of my first days at school I was clouted by the teacher for what she termed using “gutter talk”. I had arrived in class complaining of being fair drookit. Those were the days, eh? Writing this book has brought back many memories of being cheerfully sodden. Why do Scots seem to coin so many different expressions for things? We are a most inventive nation. After all, didn’t we invent the Loch Ness Monster? What were some of the most common? Stot is a delightful word that describes how rain picks up speed on its descent, and can bounce off streets, pavements and people’s heads. In contrast, haggar is the perfect word to describe the sort of rain that drifts slowly down. What were some of the more bizarre? So frequent is the rain in Orkney and Shetland that they even have a special word, “aflak”, to denote any short pause in a storm. The Scots word “blashy” wonderfully describes rain at its wettest and most blown-about. 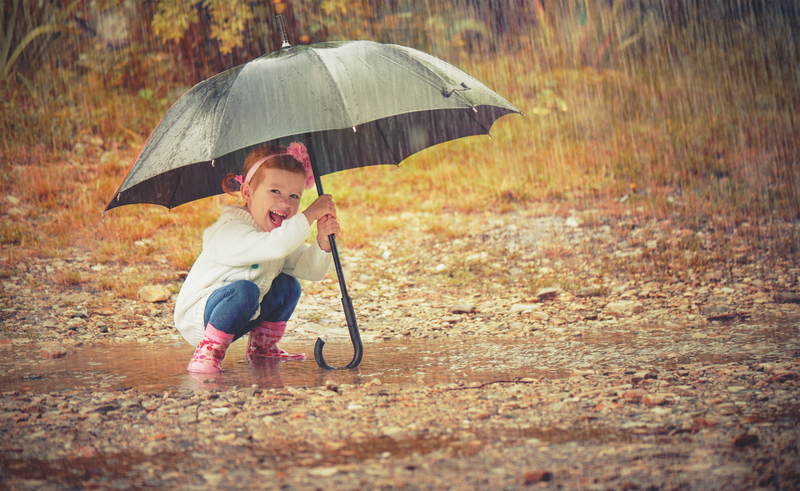 Is rain your favourite weather? How long does it take rain to fall from the sky? Given that the size of raindrops and the height from which they fall can both vary widely, it is impossible to give a precise figure. An average-sized raindrop, falling at an average speed of around 14mph from a cloud some 2,500 feet above us, would reach the ground in roughly two minutes. This occurs when rain evaporates before it reaches the ground. It is a feature of desert conditions. Does rain have a smell? Yes. The refreshing, clean smell comes from rain having passed through ozone in the atmosphere. The pleasant, slightly earthy, “after-rain” smell is termed “petrichor”, from the Greek petra (stone) and ichor (the fluid that flows in the veins of the Greek gods). Is it best to run or walk in rain?